WARNING! 120 volts may cause injury from electrical shock. Disconnect power and shut off water supply before servicing. CAUTION! Sudden operation may cause personal injury or property damage. Turn humidistat or Auto-TracTM Control System, to "off" or lowest setting before servicing. Thank you for your recent Aprilaire Humidifier purchase. We sincerely appreciate your business and are pleased to add your name to our growing list of customers. With this purchase, you have invested in the highest quality equipment currently available. Research Products Corporation is the largest manufacturer of whole house humidifiers, air cleaners and fresh air exchangers and is a recognized leader in the heating and air conditioning industry today. Please be assured that in addition to product quality, we are also committed to unit performance as well as customer satisfaction. Your unit will require periodic maintenance to assure you of continued fine performance. Since Research Products does not sell service parts and/or Water Panel® evaporators direct, please proceed as shown in the maintenance section. Now, please take a few minutes and read the appropriate section of this booklet. This will familiarize you with the benefits you will receive from the equipment you just purchased and help you understand the routine maintenance that will be required. Be sure to register your warranty with us for our records and your protection. With your purchase of a humidification system, you have invested in an automatic humidifier that operates on the evaporative principle - nature's own way of adding moisture - and will provide the proper relative humidity (see operating instructions) all during the heating season. It is very possible that you have questions concerning your new humidifier - questions on what it can do for you, and what you should do to receive maximum benefits from it. This booklet is intended to help you do exactly that. Nature, in producing an invigorating comfortable April day, combines just the right temperature and the right amount of moisture. Aprilaire Humidifiers employ the same principle, with refinements, to give you the proper relative humidity for maximum allowable comfort all winter long. The Aprilaire Humidifier (except the Models 350 and 360) is installed to operate in conjunction with the furnace blower motor. When the humidistat or control calls for humidity and the blower motor is operating, water flows to the distribution pan located at the top of the unit. The water is uniformly distributed across the width of the pan and through a scientifically designed system of outlets. It flows by gravity over the Water Panel® evaporator, the heart of the unit. Dry, hot air is moved through the moisture-laden Water Panel evaporator where the evaporation takes place. The now humidified air carrying moisture in vapor form (nature's own way) is circulated throughout the home. The Models 350 and 360 use service hot water (140°F maximum) for its heat source, as heat is needed for evaporation. While the water going to the unit is hot, the flushing water to the drain will be cold. The heat is extracted during the evaporation process. The correct water flow is determined by an orifice equipped with each drain type unit. When the unit is operating, there will be a small, steady stream of water to drain, which flushes away most of the trouble-causing minerals. Do not use the saddle valve to regulate the water flow. It is designed to be completely opened or closed. The minerals and solid residue not trapped by the replaceable Water Panel evaporator are flushed down the drain. The drain also eliminates the problems caused by stagnant water. This is the most effective and least expensive method to dispose of trouble-causing minerals. There are some homes where drain facilities are not accessible or available. For these situations, or where high water hardness is not a problem, a specially designed Aprilaire Humidifier, Model 445, is available, incorporating a water recirculating system. Capacity is high because an average-size home (10,000 cu. ft.) requires the addition of approximately 9 gallons of water per day to maintain 35% relative humidity when the outside temperature is 20°. The smallest Aprilaire Humidifier under most operating conditions, has this humidifying capacity. Trouble-free performance and minimum maintenance are assured by the design features of the Aprilaire Humidifier. All unit housing parts that come in contact with water are non-metal and will never rust or corrode. Neither heat nor water will affect them under normal operating conditions. The Water Panel evaporator, designed especially for uniform, high evaporation, and the Scale Control Insert also efficiently traps mineral deposits which are often the cause of damage to working parts in ordinary humidifiers. No "white dust" can be distributed throughout the living quarters. The Water Panel evaporator is the heart of the unit and must be in good condition to assure high capacity trouble-free performance. It should be changed annually. The granular coating in the bottom of the distribution tray is designed to provide equal distribution of the water to each of the openings assuring an even flow of water over the Water Panel evaporator. Do not clean the mineral scale off the bottom of the water distribution tray at the end of the humidification season. The scale itself provides an excellent track for the water to follow. This is actually what we try to simulate with the synthetic coating in the bottom of the tray. If the coating is removed, it is not necessary to purchase a new distribution tray or upper housing. You can accomplish the same uniform performance by applying a small amount of liquid dishwashing detergent over the entire lower surface of the water distribution tray. This will allow the water to flow evenly through each of the openings, provided, of course, the unit is level in order to achieve maximum capacity. There are many humidifiers on the market. They all add moisture . . . with varying degrees of efficiency. None, however, can provide the features, the design, the performance incorporated into your Aprilaire Humidifier. Your Auto-Trac control System is installed in the cold air return. During the first heating season, your Auto-TracTM Control System needs to be set initially to match your home's condition. Please follow these steps when adjusting your Auto-Trac (refer to Figure A). Turn the dial setting knob to"5", which is within the normal range. During the next 24-48 hours it may be necessary to adjust the dial for more or less humidity, depending on your personal comfort and home's requirements. Refer to the "Operation Guide" (Table 1). During the coldest portion of the first heating season, minor adjustments may be necessary. This is dependent upon your individual home construction, refer to the "Operation Guide" (Table 1). Condensation on windows Reduce the setting on Auto-Trac dial by 1 increment. Lack of humidity Increase setting on Auto-Trac dial by 1 increment. Humidifier does not operate Turn dial to "Test". Make certain furnace blower is operating and furnace is calling for heat. If unit still doesn't operate, consult a heating contractor. Humidifier won't shut off Turn dial to "Off". If unit continues to operate, consult a heating contractor. Test mode System operation is checked by setting the knob to "Test". make certain furnace blower is operating and furnace is calling for heat. Humidifier will operate for one minute. The relative humidity in your home will now be accurately controlled to meet your needs and should not need further adjustment during future heating seasons. Make note of the dial settings in the event you temporarily move the knob when performing annual maintenance of the Aprilaire Humidifier. Activate the furnace blower by setting your thermostat fan switch to the "On" position, or setting your thermostat to a higher temperature. Turn the Auto-Trac dial setting to the "Off" position. Then, slowly turn the dial clockwise until you hear the solenoid valve "click On". Next, slowly turn the dial counter clockwise until you hear the solenoid valve "click off". At this point, make note of the dial setting. Locate your dial setting on Table 2. Follow the dial setting to the right until it intersects with the current outdoor temperature. This is the relative humidity in your home under existing conditions. Return the thermostat and Auto-Trac to their original settings. As an example, if the outdoor temperature is 20°F, and, following step 3, the humidifier turns off at "5" on the dial range, then the relative humidity in your home is 35%. The Auto-Trac will accurately control the humidity in your home to a maximum of 45% RH and a minimum of 10% RH. The values of outdoor temperature and dial settings may fall in between or outside of the listed values in Table 2. In these cases, you can only approximate your home's actual indoor relative humidity. Your new Aprilaire Humidifier is controlled by an accurate humidistat installed either in the living area or in the cold air return. It is important to anticipate a drop in outdoor temperature and reduce the setting accordingly to avoid excessive condensation. For example, with an outdoor temperature of 20° the correct setting will be 35% relative humidity. If the temperature is expected to fall to 0° that evening, then merely reduce the setting to 25% several hours prior to the temperature change. The recommended settings on the humidistat are based on years of research (see table 3) and experience as to what is best for the average home. These settings represent a compromise between relative humidity levels that would be most desirable for comfort reasons and humidity levels that are suitable for protection of your home. For example, a wintertime indoor relative humidity of 50% may be considered ideal, but unfortunately, it probably would result in damage to your home. Observance of the recommended relative humidity levels on your humidistat, therefore, is an important safeguard. Condensation of water on inside windows in the form of fogging or frost is usually an indication of too high relative humidities. This same condensation can take place in other areas in your home with the possibility of damage resulting. The humidistat is a precision instrument that can be used to determine the relative humidity accurately in your home during the winter. Turn the dial to the lower setting, then reverse the dial direction slowly until a "click" is heard. At this point, read the relative humidity on the dial. This will be very close to the actual relative humidity in your home. To check the humidifier operation, set the humidistat above the click point, make sure that the water saddle valve is open and that there is electricity to the unit. Generally, with all models except the 350 and 360 Aprilaire Humidifiers, the furnace blower motor must be operating for the Aprilaire Humidifier to function. After the humidifier has operated for several minutes and water is entering the unit and coming out at the drain, reduce the humidistat setting below the click point and the unit should automatically shut off. Now set the humidistat dial at the recommended inside relative humidity, depending on the outside temperature. Follow the suggested settings prior to a drop in the outside temperature. Be sure to keep fireplace dampers closed when not in use. They provide an excellent escape route for heat, as well as humidity. Humidity is lost at an even faster rate than heat because water vapor tends to seek its own level and your humidifier would not be able to replace it even when running at full capacity. On occasion, indoor moisture producing activities such as clothes drying, cooking, showers, etc., may raise the relative humidity level higher than it should be, even though the Aprilaire Humidifier is not operating. Telltale indications, again, are condensation or frost on cold surfaces such as windows, doors, walls, etc. If such condensation persists for several hours, your home should be ventilated to dissipate the potential damaging excess moisture levels. Your humidifier will operate effectively using either hot, cold, hard or mechanically softened water. Whether to use available tap water, even though it may be quite hard, or chemically softened water, is a common concern to homeowners when installing a humidifier. Water used in homes contains varying amounts of minerals. The residue remaining as a result of hard water evaporation is primarily calcium and magnesium components and is usually quite hard, scaly, and dense. Residue from softened water tends to be soft and fluffy and has a greater volume than hard water scale. The service life of a Water Panel evaporator may be extended by using hard water, but in either case, the Water Panel evaporator is usually changed once a year. In the Model 445 Aprilaire Humidifier, these solids will build up on the evaporator surface, in the reservoir and pump section. This is why proper maintenance is important and necessary. Service hot water, 140° maximum, is recommended with drain type units for increasing capacity and for heat pump applications. In the drain-equipped models, most of these solids are effectively controlled by flushing them down the drain. For best performance, we recommend that you replace the water panel evaporator in your Aprilaire Humidifier annually. Use only genuine Aprilaire Stock No. 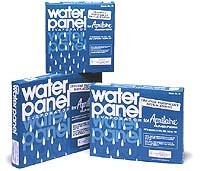 10, 12, or 35 replacement water panels. For the models 220, 224, 440,445A, 445, 550A, 550, 560A and 560, close the bypass damper if provided. For the models 445A and 445, empty the reservoir. Humidifiers controlled by the Auto-Trac Control System require no control adjustment. Shut off the water supply to the humidifier by closing the saddle valve. Humidifiers controlled by a manual humidistat, simply turn the humidistat to the "Off" position. Shut off the water supply to the humidifier by closing the saddle valve. NOTE: Periodic inspection and preventive maintenance of your total heating system is important for efficient and safe operation. Your heating contractor should include humidifier service at the same time. All models, except No's. 445A and 445, are equipped with an in-line water strainer and orifice as shown below. These parts should be inspected and cleaned periodically to assure continued proper unit performance. Disconnect electrical power to the furnace and shut off water supply. Disconnect the water line at the inlet compression nut. Remove the in-line strainer from inside the inlet fitting by using a small nail or wire. Flush the in-line strainer clean or replace with a new strainer, Service Department, Part No. 4004. Replace the in-line strainer and reconnect the inlet water line (Double Wrench To Prevent Leaking). Disconnect the water line at the outlet compression nut. Remove the orifice from the copper or plastic tube and make sure this small opening is unplugged. Replace the orifice and reconnect the outlet water line (Double Wrench To Prevent Leaking). Turn on water supply and reconnect electrical power to the furnace. Your Research Products Corporation Aprilaire® Humidifier unit is expressly warranted for one (1) year from date of installation to be free from defects except, however, for the disposable water panel which will have to be replaced from time to time depending upon the amount of use. Research Products Corporation's exclusive obligation under this warranty shall be to supply, without charge, a replacement for any part of the humidifier which is found to be defective within one (1) year period and which is returned not later than thirty (30) days after said one (1) year period by you to either your original supplier or to Research Products Corporation, Madison, Wisconsin 53701, together with the model number, manufacturing code number and installation date of the humidifier. THIS WARRANTY SHALL NOT OBLIGATE RESEARCH PRODUCTS CORPORATION FOR ANY LABOR COSTS AND SHALL NOT APPLY TO DEFECTS IN WORKMANSHIP OR MATERIALS FURNISHED BY YOUR INSTALLER AS CONTRASTED TO DEFECTS IN THE HUMIDIFIER ITSELF. IMPLIED WARRANTIES OF MERCHANTABILITY OR FITNESS FOR A PARTICULAR PURPOSE SHALL BE LIMITED IN DURATION TO THE AFORESAID ONE YEAR PERIOD. RESEARCH PRODUCTS CORPORATION'S LIABILITY FOR INCIDENTAL OR CONSEQUENTIAL DAMAGES, OTHER THAN DAMAGES FOR PERSONAL INJURIES, RESULTING FROM ANY BREACH OF THE AFORESAID IMPLIED WARRANTIES OR THE ABOVE LIMITED WARRANTY IS EXPRESSLY EXCLUDED. THIS LIMITED WARRANTY IS VOID IF DEFECT(S) RESULT FROM FAILURE TO HAVE THIS UNIT INSTALLED BY A QUALIFIED HEATING AND AIR CONDITIONING CONTRACTOR. IF THE LIMITED WARRANTY IS VOID DUE TO FAILURE TO USE A QUALIFIED CONTRACTOR, ALL DISCLAIMERS OF IMPLIED WARRANTIES SHALL BE EFFECTIVE UPON INSTALLATION. Some states do not allow limitations on how long an implied warranty lasts or the exclusion or limitation of incidental or consequential damages so the above exclusion or limitations may not apply to you.